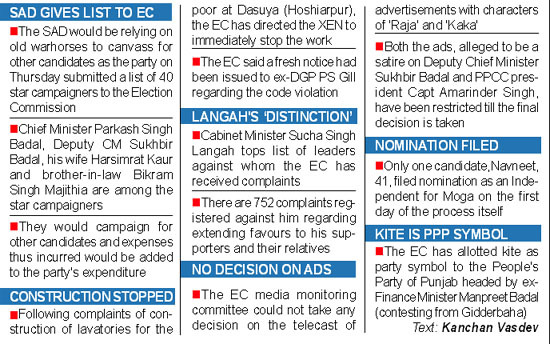 With the Election Commission (EC) extra vigilant on poll expenses, the Shiromani Akali Dal (SAD) has submitted a list of 40 star campaigners out of which 28 are party candidates. After having earned accolades for conducting free and fair elections in the southernmost state in April last, Tamil Nadu Chief Electoral Officer Praveen Kumar is now headed north to repeat his show in Punjab. The BJP will focus on rising inflation and rampant corruption in the country while highlighting development works in the state during campaigning. This was conveyed to all the 23 party candidates at a meeting here today that was chaired by national secretary and state elections incharge JP Nadda. The Bahujan Samaj Party (BSP), that announced candidates for 21 more assembly constituencies today, plans to hold four big election rallies in the state. The BSP supremo, Mayawati, will address rallies at Kharar and Nawanshahr on January 21 and at Muktsar and Amargarh on January 22. Till date, the BSP has announced candidates for 111 constituencies. The party has made it clear that it will not have any truck with the Sanjha Morcha headed by Manpreet Singh Badal. This constituency is said to be a stronghold of the Jakhar family. In the past two assembly elections, voters have elected Sunil Kumar Jakhar of the Congress as their MLA. Earlier called the Beas constituency, the newly constituted Baba Bakala (Reserve), constituency was given a stepmotherly treatment, allege voters. This was primarily owing to the strained ties between its Akali MLA Manjinder Singh Kang and the party leadership.The segment saw constant friction between SAD and Congress activists. A buoyed Gurbachan Singh Babbehali, SAD legislator from Gurdaspur, who has been re-nominated for the coming elections, has had a headstart in campaigning, covering several villages even as the Congress has been dithering on its nominee. Finally, the four accused in Jalandhar hotelier Gurkirat Singh Sekhon murder case have been shifted to the Gurdaspur jail. The prime accused, Prince Makkar, is nephew of Adampur MLA and Akali candidate from Kapurthala Sarabjit Singh Makkar. Assembly polls or kabaddi cup? Thousands of inmates languishing in various jails of the state would not be able to cast their franchise on January 30 even though those convicted under particular sections can contest the forthcoming assembly poll. The Punjab Government is just not hooked to the idea of arresting the menace of drug addiction in the jails across the state. Neither prevention nor cure of the addict inmates seems to be high on the government agenda, as it can safely be diagnosed from its indifference. Following a statewide protest by the Bharti Kisan Union (Lakhowal and Ugrahan), three trains were delayed here today. Dwelling on the agenda of youth empowerment through quality education, skills development and employment, most of overseas participants expressed serious concerns over deterioration in the standard of senior secondary education and post-matriculation dropout rate in Punjab at the Punjabi Parvasi Divas conference here today. Eleven of the 30 Punjabi youths detained by a maintenance company in Kuwait have returned to India. Thanks to the India Embassy in Kuwait which facilitated their return after the matter was taken up by the Punjab State Commission for Scheduled Castes (PSCSC) with the External Affairs Ministry. For the first time, ecology will become an issue in the state assembly elections with environmentalists floating a front that will vote for candidates committed to an agenda which supports sustainable livelihood, including health security. Not even in her teens, she is battling it out with cancer and her own father. Just 10 and suffering from blood cancer, Dhriti Singla has moved the Punjab and Haryana High Court against her father Dr Arvind Singla, the State of Punjab and other respondents. Taking up a petition filed in public interest for inquiry into the alleged misuse of power by BJP MLA Master Mohan Lal and SAD MLA Sarabjit Singh Makkar, the Punjab and Haryana High Court today issued notice of motion to the State and both the MLAs. With the Election Commission (EC) extra vigilant on poll expenses, the Shiromani Akali Dal (SAD) has submitted a list of 40 star campaigners out of which 28 are party candidates. This will help these candidates to divert expenses incurred on their campaign to the party expense. Candidates little known outside their constituencies have also been named star campaigners. The ECI has made it mandatory for the candidates to open an account in any nationalised bank for daily expenditure. A candidate could run a single account or open a joint account with his election agent. Withdrawals of Rs 20,000 or more by candidates for payments would be through cheques only. Local leaders like Jagdev Singh Talwandi, Sharanjit Singh Dhillon and Prem Singh Chandumajra have been named star campaigners simply to skirt poll expenses. Most of these 28 candidates are unlikely to campaign in their own constituencies more than once during the two weeks of campaigning after withdrawals. That a candidate will campaign in another constituency besides his own is expecting a bit too much. Praveen, whose ideas helped check the use of money power to buy votes in Tamil Nadu, would now be keeping tabs on those trying to entice voters to indulge in the illegal practice in the January 30 Punjab assembly elections. The development follows after several political parties in the state aired concerns about the possibility of money being used to purchase votes. In the southern state, cash totalling Rs 57 crore and goods worth Rs 22 crore meant for the electorate were seized last year. “With the seizures, we were able to ensure impartial poll. We will devise a similar strategy in Punjab,” he added. Punjab is not the only state where an electoral officer from outside is being deployed to check poll violations as the CEO of Bihar, too, would be assisting the EC in Uttar Pradesh. However, the smaller states like Uttarakhand and Goa, which too are poll-bound, would not witness the importing of an electoral officer. The BJP will focus on rising inflation and rampant corruption in the country while highlighting development works in the state during campaigning. This was conveyed to all the 23 party candidates at a meeting here today that was chaired by national secretary and state elections incharge JP Nadda. Among others present were national general secretary Capt Abhimanyu, MP and convenor of the campaign committee, MP Navjot Sidhu and state BJP chief Ashwani Sharma. Nadda asked the candidates to lay emphasis on the development projects under the BJP-SAD coalition. “You must draw a detailed list of such works in your constituencies and highlight these during campaigning,” he told the party nominees. He directed them to visit the houses of RSS workers and party activists to solicit their support, to take the support of religious and social organisations and to form mohalla- level committees for great coordination. Capt Abhimanyu sought from the candidates a list of disgruntled workers who refused to cooperate with them. “We will then depute senior leaders to redress their grievances and placate them,” he said. He also asked the candidates to ready their canvassing schedules to prevent last-minute hitches, to depute workers with a thorough knowledge of the poll code for all paper work and to keep details of daily expenditure. The candidates were later handed over the nomination forms. The Bahujan Samaj Party (BSP), that announced candidates for 21 more assembly constituencies today, plans to hold four big election rallies in the state. The BSP supremo, Mayawati, will address rallies at Kharar and Nawanshahr on January 21 and at Muktsar and Amargarh on January 22. Till date, the BSP has announced candidates for 111 constituencies. The party has made it clear that it will not have any truck with the Sanjha Morcha headed by Manpreet Singh Badal. BSP general secretary Narender Kayshap rejected allegations that the BSP had put up candidates in various constituencies only to benefit the ruling SAD-BJP combine. “These allegations are mischievous and being levelled by vested interests ”, said Kayshap. He said the BSP’s reading of the situation was that there would be four-cornered contests in almost all constituencies and this would benefit the BJP. He said in the 2007 elections, the BSP had lost 20 seats with a margin of 1,000 votes or more. “At that time the contest was three-cornered. However, with the Sanjha Morcha in the fray, the election scene has changed and it will certainly benefit the BSP”,he claimed. Asked whether the BSP nominees were all from the Scheduled Castes, BSP state president Avtar Singh Karimpuri said the candidates belonged to all sections. Out of the 111 candidates announced so far, 50 were from the Scheduled Castes. The BSP today announced Raman Kumar from Dinanagar); Parveen Kumar from Gurdaspur; Jagpreet Singh from Bholath; Charanjit Hans from Kapurthala; Tarsemlal Dola from Sultanpur Lodhi; Hans Raj from Ludhiana North); Balbir Singh from Gill; Jugal Mahajan from Amritsar South; Jagjit Duggal from Amritsar Central; Des Raj from Jandiala Guru; Kashmir Singh from Patti; Kewal Singh from Nihalsinghwala; Dashera Singh from Maur; Randhir Singh from Rampura Phul; Harbans Singh from Bathinda Rural; Balbir Singh Bahia from Jaito; Shankar Dalyia from Patiala City; Harmail Singh from Sangrur; Rajinder Singh from Banga; Baldev Singh from Atam Nagar and RM John Ludhiana Central. 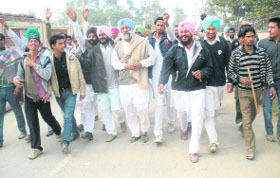 Pathankot Raman Bhalla, Gurdaspur Raman Behl, Dinanagar (SC) Aruna Chaudhary, Qadian Charanjit Kaur, Batala Ashwani Sekhri, Sri Hargobindpur (SC) Balvinder Singh Laddi, Fatehgarh Churian Tript Rajinder Bajwa, Dera Baba Nanak Sukhjinder Randhawa, Ajnala Harpratap Singh Ajnala, Raja Sansi Sukhbinder Sarkaria, Majitha Shailender Jit Shelly, Jandiala (SC) Sardul Singh, Amritsar North Ashwani Kumar Pappu, Amritsar West (SC) Raj Kumar Verka, Amritsar Central OP Soni, Amritsar East Simpreet Kaur Bhatia, Amritsar South Jasbir Singh Dimpa, Attari (SC) Tarsem Singh, Tarn Taran Dr Dharamveer Agnihotri, Khem Karan Gurchet Bhullar, Patti Harminder Singh Gill, Khadoor Sahib Ramanjit Singh Sikki, Baba Bakala (SC) Ranjit Chhajalwadi, Bholath Sukhpal Khaira, Kapurthala Rana Gurjit Singh, Sultanpur Lodhi Navtej Singh Cheema, Phagwara (SC) Balbir Raja Sodhi, Phillaur (SC) Chaudhary Santokh Singh, Nakodar Amarjit Singh Samra, Shahkot Col CD Kamboj, Kartarpur (SC) Ch Jagjit Singh, Jalandhar West (SC) Suman Kaypee, Jalandhar Central Raj Kumar Gupta, Jalandhar North Avtar Henry, Jalandhar Cantt Jagbir Brar, Adampur (SC) Satnam Singh Kainth, Mukerian Ajit Kumar Narang, Dasuya Ramesh Chander Dogra, Urmar Sangat Singh Gilzian, Sham Chaurasi (SC) Ram Lubhaya, Hoshiarpur Sunder Sham Arora, Chabbewal (SC) Dr Raj Kumar, Garhshankar Lov Kumar Goldy, Banga (SC) Tarlochan Singh Soondh, Nawanshahr Guriqbal Kaur, Balachaur Rajwinder Singh Lucky, Anandpur Sahib Rana KP, Rupnagar Romesh Dutt Sharma, Chamkaur Sahib (SC) Charanjit Channi, Kharar Jagmohan Kang, SAS Nagar Balbir Sidhu, Bassi Pathana (SC) Harbans Kuar Dullo, Fatehgarh Sahib Kuljit Nagra, Amloh Randeep Singh Nabha, Khanna Gurkit Singh Kotli, Samrala Amrik Singh, Sahnewal Vikram Bajwa, Ludhiana East Gurmail Singh Pahelwan, Ludhiana South Ashok Parashar Puppy, Atam Nagar Malkiat Singh Birmi , Ludhiana Central Surender Dabar, Ludhiana West Bharat Bhushan Ashu, Ludhiana North Rakesh Pandey, Gill (SC) Malkiat Dhaka, Payal (SC) Lakhbir Singh Lakha, Dakha Jassi Khangura, Raikot (SC) GS Boparai, Jagraon (SC) Ishar Singh Meharban, Nihal Singh Wala (SC) Ajit Singh Shant, Bagha Purana Darshan Brar, Moga Joginder Pal Jain, Dharamkot Kaka Surjit Singh Lohgarh, Zira Naresh Kataria, Ferozepur Urban Parminder Singh Pinky, Ferozepur Rural (SC) Satkar Kaur, Guruharsahai Rana Gurmit Sodhi, Jalalabad Malkait Singh, Fazilka Dr Mohinder Rinwa, Abohar Sunil Jakhar, Balluana (SC) Giriraj Rajoura, Lambi Maheshinder Singh Badal, Gidderbaha Amarinder Singh Raja Wiring, Malout (SC) Nathuram, Muktsar Karan Brar, Faridkot Avtar Brar, Kotkapura Ripjit Brar, Jaito (SC) Joginder Singh Punjgrain, Rampura Phul Gurpreet Singh Kangar, Bhucho Mandi (SC) Ajaib Singh Bhatti, Bathinda Urban Harminder Jassi, Bathinda Rural (SC) Makhan Singh, Talwandi Sabo Jeet Mohinder Singh Sidhu, Maur Mangat Rai Bansal, Sardulgarh Ajit Inder Singh Mofar, Budhlada (SC) Satpal Singh Mulewalla, Lehra Rajinder Kaur Bhattal, Dirbha (SC) Ajaib Singh Rataul, Sunam Aman Arora, Bhadaur (SC) Mohd Sadiq, Barnala Kewal Dhillon, Mehal Kalan (SC) Harchand Kaur, Malerkotla Razia Sultan, Amargarh (SC) Surjit Singh Dhiman, Dhuri Arvind Khanna, Sangrur SPS Sibia, Nabha (SC) Sadhu Singh Dharamsot, Patiala Rural Brahm Mohindra, Rajpura Hardayal Kamboj, Dera Bassi Jasjit Singh Randhawa, Ghanour Madan Lal Jalajpur, Sanour Lal Singh, Patiala Amarinder Singh, Samana Raninder Singh and Shutrana (SC) Nirmal Singh. Son of Balram Jakhar, Sunil Kumar Jakhar enjoys a good rapport with PCC chief Capt Amarinder Singh. A good orator, he raised a number of farmers’ issues during his tenure. His popularity can be gauged from the fact that merely one more person has applied for the Congress’ ticket from this constituency. The BJP in the district has been rendered weak because of infighting. 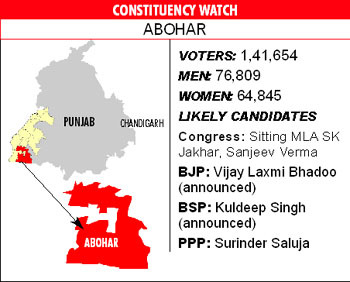 The failure of its leaders in getting district status for Abohar has left voters disappointed. The BJP has allotted the ticket to Vijay Laxmi Bhadoo, Social Welfare Board Chairperson. The PPP and the BSP have not much influence in this segment. Projects: District status has been accorded to neighbouring Fazilka and denied to Abohar. This time, poor civic amenities is a major issue in urban areas while rural voters are demanding better irrigation facilities. VOX POPULI: Voters of this constituency are all praise for sitting MLA Sunil Kumar Jakhar who has always been accessible to the people. “After Jakhar became MLA in 2002, the area saw unprecedented development. In 2007, he again got the people’s mandate but could do little with the SAD-BJP government in power. Nevertheless, he did his best and raised several issues regarding the area in the assembly,” said an elderly resident. LOOKING BACK: In 1997, Dr Ram Kumar Goyal defeated Sajjan Kumar Jakhar, elder brother of Sunil Kumar Jakhar. But in 2002 and 2007, Sunil Jakhar defeated Dr Ram Kumar Goyal. In 2002, a Jakhar family loyalist, transporter Sudhir Nagpal, contested as an Independent, but was defeated. This under-developed constituency was declared ‘hypersensitive’ after an Akali activist was shot dead in 2007, forcing the Election Commission to hold elections a month later here. Kang defeated Congress candidate Jasbir Singh Dimpa, who was sitting MLA, by 4,183 votes. This time, with the seat declared reserved, the SAD may field SGPC member Jathedar Baljit Singh Jalalusma. The Congress may field one of the Dimpa loyalists. Ranjit Singh Chhajjalwadi is also in race for the Congress ticket. Projects: With Kang allegedly showing little interest in nursing the constituency, Chief Minister Parkash Singh Badal regularly held Sangat Darshan programmes here. The CM in August last distributed Rs 3 crore among 65 village panchayats. He laid stones for a railway overbridge and a four-lane project, announcing that both the projects would be completed within nine months. He also inaugurated a Rs 8.50-lakh project to connect Baba Bakala town with the 66 KV Beas feeder to ensure more power supply to Baba Bakala residents. VOX POPULI: Residents say instead of development work, they have only seen AK-47 rifles being brandished here. “With our MLA having no say in local matters, he left his constituency unattended and all works were stalled. During the CM’s Sangat Darshan, we apprised him about our problems relating to basic infrastructure and got nothing but more promises”, say residents. LOOKING BACK: The last four assembly elections has seen a contest between the SAD and the Congress. In 2002, Congress representative Dimpa grabbed the seat with 50.61 per cent ( 45,832 votes) against SAD’s Kang who got 43.49 per cent (39382) votes. Earlier in 1997, Dimpa was defeated by SAD’s Manmohan Singh with a wafer thin margin. In 1992, Pawan Kumar of Congress won the seat against Kulwant Singh, an Independent candidate. During the 2007 elections too Babbehali had begun canvassing much ahead of Congress candidate PS Bhinder and had emerged the winner. He was able to secure the support of villages that eventually turned the tide in his favour as he failed to get enough votes in Hindu-dominated Gurdaspur town, despite the BJP helping him. Babbehali has been meeting sarpanches and other opinion leaders every morning and evening. He has been evaluating the party position in the wards represented by SAD and BJP councillors. Late at night, he meets people at the SAD office on Tibri road. The MLA’s position has been strengthened with local BJP leaders finally deciding to back him. The BJP has a committed vote bank of 25,000 voters in the area. A fortnight ago, district president Rakesh Jyoti had revolted against his candidature. The delay on the part of the Congress in announcing its candidate may once again cost the party dear. Superintendent of the Gurdaspur jail Shammi Kapoor said the accused had been lodged in an ordinary barrack. Gurkirat’s father Rajbir Singh Sekhon had complained that the accused had not been shifted to Gurdaspur despite directions by Sessions Judge KK Garg as Sarabjit Makkar was an influential man. Sekhon had said he had brought the matter to the notice of the Jail Minister and the DGP, Prison, but to no avail. Such are the provisions of Section 62 (5) Representatives of the Public Act (RPA), 1951, that mention that no imprisoned person can vote. However, Section 8 of the RPA Act states that convicted persons with sentence less than two years can contest. Additional Chief Electoral Officer Raj Kamal Chaudhary said the Punjab election office received instructions from the Election Commission of India a few days ago that no inmate be allowed to vote. However, he stated, if a person was convicted for some particular offences that entail less than two years of imprisonment, then he could contest the elections. The offence includes crime under FERA, Corruption Act, Protection of Civil Rights Act, Sections 153 A of the IPC and various Sections of the IPC related with electoral malpractices, Customs Act, NDPS and TADA. AIG (Jails) DK Sidhu said there were over 10,000 undertrials lodged in 23 jails of the state who would not be allowed to votes. These undertrials are lodges in eight central jails located at Kapurthala, Faridkot, Ferozepur, Patiala, Bathinda, Ludhiana, Amritsar and Gurdaspur (with capacity from 700 to 2800), six district jails at Ropar, Kapurthala, Hoshiarpur, Nabha, Sangrur and Mansa (with capacity below 500), eight sub jails at Dasuya, Pathankot, Phagwara, Patti, Malerkotla, Moga, Fazilka and Muktsar (with capacity from 25 to 250), Borstal jail at Ludhiana (capacity 500 prisoners from 18 to 21 years of age) and women jail at Ludhiana. Taking strong exception to these provisions of the RPA Act, a human rights activist, advocate Rajinder Bhatia, has urged the Union Government to amend Section 62 (5) of the Act that prohibits the undertrials from voting. 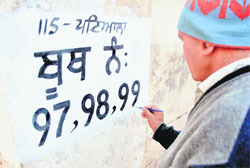 In Kapurthala jail alone, more than 350 inmates are crying for help. Nothing less than 50 of them are seriously suffering from withdrawal symptoms. But, so far the state government has maintained an apathetic and chronic silence over the issue. Magnifying its indifference towards the plight of the addicts is the fact that the Prisons Department of the Punjab Police has been fruitlessly shooting off communication after communication to the government. The authorities are being repeatedly asked to ensure the supply of medicines to help the addict inmates fight the withdrawal symptoms. But the entire exercise has proved to be a bootless errand. Indications are that the apathy is fast becoming a poll issue in parts of Punjab, with at least some of the families of the addict inmates refusing to participate in the democratic process of electing their representatives to the assembly, if the authorities still refuse to be shaken out of slumber. Available information suggests that at least three reminders have been mailed by Punjab Director-General of Police (Prisons) Shashi Kant to the authorities. "As such, these medicines and facilities are required urgently for this purpose with the additional request that Dr Sandeep Bhola of Civil Hospital, Kapurthala, be associated with the detoxification programme". The full impact of the need to treat the drug addicts in Kapurthala jail was felt soon after the prison hospital was attacked by the inmates in November last. It is believed that withdrawal symptoms among the addict inmates had added fuel to the fire in the incident of rioting and arson in the jail complex. Subsequently, around 10,000 tablets and capsules of psychotropic drugs looted from the jail hospital were seized from the inmates. A number of activists gathered at the railway station and blocked the rail tracks between 12 noon and 4 pm. They were seeking a hike in the minimum support price (MSP) of wheat and paddy. Meanwhile, the passengers were a harried lot as they were left stranded for several hours. Khanna: On the call given by BKU (Lakhowal), more than 200 farmers sat on a dharna on railway tracks at Khanna. The protesters shouted slogans against the Central Government. BKU president Ajmer Singh Lakhowal said trains were stopped at 16 places in Punjab. He alleged that the Centre had turned a deaf ear towards their genuine demands. Canada as a partner country in this years' conference was well represented, both among speakers and the audience. 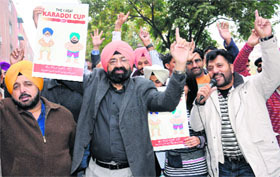 Though Punjab Deputy Chief Minister Sukhbir Singh Badal, NRI Affairs Minister Balbir Singh Bath, Chief Secretary SC Aggarwal and NRI Commissioner Vijay Partap were conspicuous by their absence, overseas Punjabis from Canada, including Ontario Minister Harinder Takhar, Alberta MLA Peter Sandhu and former MP Gurbax Malhi, talked about how Punjabis have scripted a success story in their present country of abode. The participants endorsed the suggestion made by the secretary-general of the International Punjabi Chamber for Service Industry Gulshan Sharma that immigration overseas should be only through legitimate, decent and dignified means. 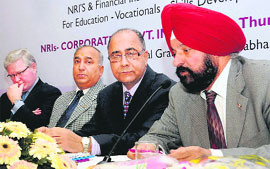 Satinder Dhiman, a management professor in North America, through video conferencing, expressed deep concern that the dropout rate of students for post-matriculatiuon education in Punjab had shot up to more than 90 per cent. Without education, he said, no state could come up economically. Canada's Consul-General in Chandigarh Scot Slessor said what Canada needed most was young skilled people who were comfortable in speaking English. More than 50 per cent of the total Indian immigrants in Canada come from Punjab and its surrounding areas. Scot Slessor said list of skills in demand in Canada were all prominently displayed on the government websites. Advanced countries did not need many people with higher educational qualifications, including PhDs, but they needed plumbers, drivers, mechanics or people trained in other trades in demand. Other basic requirement was that they should be conversant with English. Ontario Minister for Government Services said Punjabis made up for their deficiencies in education with "jugads". With their hard work and unprecedented ability to adapt themselves to the new work and living environs, they had made major strides in every area. Peter Sandhu from Alberta said when he left India more than three decades ago, the standard of high school education was pretty good. But unfortunately, it had deteriorated rapidly. The government needed to focus on reviving education network, besides imparting training in trades that were in demand overseas. Two of the returned youths, Kulwinder Kumar of Lamma in Jalandhar and Gurmail Singh of Phagwara, said they along with 28 Punjabis had been detained by a company, Arab Centres, for the past nine months. The company forced them to stay in Kuwait even after the expiry of their visa. They could not move out due to the fear of getting arrested, they added. “Ailing Punjabis were even refused medicines. A society of Kerala highlighted our plight on YouTube," they said. Kulwinder also informed about their condition to his sister on the phone. "My sister contacted chairman of the PSCSC Rajesh Bagha, who took up the matter with the Union External Affairs Ministry,” he said. The environmentalists, led by the Kheti Virasat Mission, include the BKU (Rajewal), the BKU (Ekta) and Sidhupur factions. These organisations have pockets of influence in Bathinda, Mansa, Amritsar, Tarn Taran and Hoshiarpur districts. Former Takht Damdama Sahib jathedar Giani Kewal Singh is a member of this mission. The “Vatavaran Ate Samaj Bachao Morcha” has met politicians of all hues and will meet them again to elicit their commitment, based upon which it will lend support to different candidates. Morcha head Umender Dutt, who has been championing the cause of orgnanic farming besides leading farmers’ movement against GM crops in Faridkot district since 2005, says the SAD-BJP government has failed to take affirmative steps to protect environment. He says the attempt to clean riverwaters has failed but hastens to add that things were no better during the earlier Congress rule. “We want all political parties to formulise a development model with a paradigm shift in agriculture practices”, says Umendra. This includes a commitment on organic farming and a no to GM crops. Besides, the environment group wants the government to ensure health security for all farmers and the setting up of a cancer hospital in Bathinda. Umendra claims opening a private hospital in the cancer belt will not help small farmers at all. Umendra says the group will also demand an institute for environment health research and studies. He says an ecology audit is needed to understand the damage caused to environment and how that can be rectified. The activist says a state-level water conservation drive should be launched with a time-bound action plan to rejuvenate old water bodies. He says this is necessary as 108 of the 138 blocks have been designated as ‘dark zones’ with the ground water level abysmally low. Umendra says an environment commission should be constituted to take up environment conservation. The morcha led by him has called for earmarking budget for promoting sustainable agriculture, including organic farming. But as her father did not appear before the court today either himself or through his counsel, Justice Surya Kant, in a first-of-its-kind order, directed Patiala Deputy Commissioner and SSP to ensure his presence before the Bench on the next date of hearing. In the petition filed through her mother Dr Punam Singla, Dhriti is seeking the release of "advance anticipated expenditure". Dhriti has asserted that a Punjab government's policy allows its employees and pensioners to approach the heads of the departments concerned for release of anticipated expenditure. Going into the background of her malady, Dhriti asserted she was suffering from acute lymphoblastic leukemia. It was diagnosed when she was four and even at that time Rs 10 lakh was spent on the treatment. She added her mother, a homeopathic doctor, was getting Rs 20,000 maintenance from her father after her parents' separation. Taking up the petition, Justice Surya Kant asserted: "The State counsel has brought on record an order whereby the medical board, headed by Punjab director, health and family welfare, has been constituted to give its opinion regarding the future course of treatment to be provided to the petitioner urgently. "Having regard to the serious nature of the ailment and the desirability of immediate treatment, it appears expedient to request the Director, PGIMER, Chandigarh, to constitute a medical board of subject experts, who shall examine the patient within four days and submit their report to this court. "Since respondent Dr Arvind Singla, medical officer, Nabha jail, is neither present in person nor through his counsel, the DC and the SSP at Patiala shall ensure that the respondent shall remain present in the court on the next date of hearing". Chief Justice Ranjan Gogoi and Justice Mahesh Grover also issued notice to the excise and taxation commissioner and two other persons, who had allegedly obtained undue favor. In his petition, Jalandhar resident Surinder Mittal alleged that both these MLAs had issued communication in which it was written that the bearer of the letter was in close relation and his truck should not be stopped. One such letter was issued by Makkar and another by the then Transport Minister Master Mohan Lal.